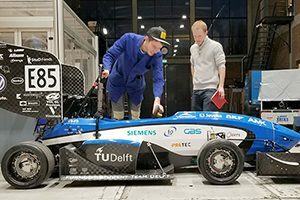 Graduate student Kevin Chan ’17 (former MIT Motorsports electrical lead as an undergrad) and his teammates traveled to Europe over IAP to meet with Formula SAE teams from five different universities. Kevin saw some of the best student-built formula cars in the world. He also came back with a new appreciation for the Edgerton Center Area 51 shop, in which students from all majors and class years can learn how to fabricate parts themselves for their single-seat electric race car. Kevin shared his experiences in a blog post featured on the Admissions website.